It’s a Fall tradition! Fall mean’s it’s time for the 18th Annual Jameson 5K at Southwestern! 18 Years and running strong! "Save the date for the 18th Annual Jameson 5K at Southwestern!" The Jameson 5K at Southwestern began in 2001 as a way of honoring the memory of Jaysn Flynn Jameson and to increase the endowment of the Jaysn Jameson Memorial Scholarship Fund at Southwestern University. Each year of the race our goal is to improve upon the last year and build the race to a premiere event for the University and Georgetown. 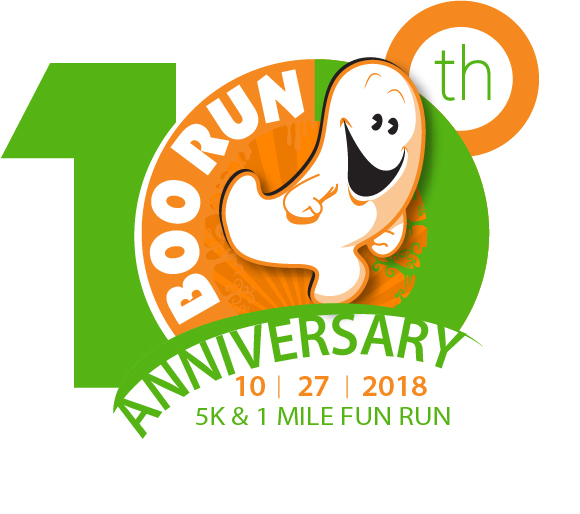 The Boo-Run is an annual 5K and 1 Mile Fun Run put on by the Exceptional Georgetown Alliance (EGA). This year, the Boo-Run just happened to co-incide with the Jameson 5k. The Boo-Run route follows the San Gabriel River at San Gabriel Park, but recent heavy flooding has left San Gabriel Park in bad shape, and the Boo-Run was cancelled for this weekend. But Boo-Runners, don’t worry. If you had your heart set on running in a 5k this weekend, JOIN US! We’ve opened special registration just for our Boo-Runner friends. Simply click the link below to register for the Jameson 5K this weekend. We’d love to have you! Registration: There are 3 ways to register for the Jameson 5K: online registration, via snail mail, or at the event on race day. In accordance with IRS guidelines Southwestern University is required to inform you that the fair market value of the Jameson Run Tshirt is $3.57. Fees: $30 for adults; $25 for Southwestern students and Seniors (+55). Fees increase by $5 for everyone if received on or after Oct. 19, 2018. Packet Pick-up for the Jameson 5K will be available on Friday, October 26 from 10:00 AM to 7:00 PM at Mundy Hall on the campus of Southwestern University. Packet Pickup is also available the morning of the event from 6:30 AM to 7:45 AM in front of Mundy Hall (across from Start/Finish line) on the campus of Southwestern University. Chip Timed: Chips will be attached to the race bib that is assigned to each participant. The race bibs with the chips already attached will be available for pickup during packet pickup times on Friday and Saturday and at the registration tables. Awards: trophies, door prizes and tons of goodies in-between! The Jameson 5K at Southwestern began in 2001 as a way of honoring the memory of Jaysn Jameson and to increase the endowment of the Jaysn Jameson Memorial Scholarship Fund. Each year of the race our goal is to improve upon the last year and build the race to a premiere event for Southwestern University and Georgetown. Fun Runs in general are not large fundraisers unless there are sponsors that underwrite the expenses of the event. Each year the Jameson 5K at Southwestern has been supported by many local businesses, making it possible for ALL the registration fees collected to be donated DIRECTLY to the Jaysn Jameson Memorial Scholarship Fund. During 2001, the first annual event, there were 76 registrants for the race, of which 62% of the registrants had a tie to Southwestern University by being an alumni, student, faculty or staff member. Of the 76 registrants 66% were from Georgetown and the surrounding areas. All the registration fees were donated to the Scholarship Fund which totaled $810. In 2017, there were more than 246 registrants. Our largest event was in 2007 with 356 registrants. Last year close to 74% of all registrants were from the Georgetown / Austin area. Many of these registrants have participated in this event for multiple years. In 2017 alone, more than $10240 was donated to the Scholarship Fund from the registration fees and additional donations received. This contribution brought the total amount donated from all the races to the Jaysn Jameson Memorial Scholarship Fund to over $137,633! Thank you all so much for your on-going support to the Jameson 5K! We're growing every year, and the scholarships we fund are really making a difference in the lives of young people. Thank you, thank you, thank you! We've already come a long way, and with your generous support, we're going to keep doing what we do! Thanks again, and I'll see you on run day!